Dust is a problem in any working environment. There are multiple sources of dust, smoke and chemical odor in the production Line and process. They may include conveyor belts, furnaces, cutting machines, grinding machines, mixing machines, chrome plating, paint mixing and spraying, and so on. 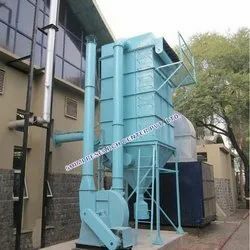 It is the differing properties of various kinds of dust and gas that largely determine the types of pollution control equipment to be used in any industry. Dust varies in size, shape, abrasiveness, resistivity and other physical properties. These polluted organisms cause health hazard to workers and operators of such machine, they also damage working environment and reduce capacity output. At Shimi Research Center Private Limited, we try to offer you a very cost effective solution to any typical dust control problem. In Reverse Air Bag Filter, the bags are fastened onto a cell plate at the bottom of the baghouse and suspended from an adjustable hanger frame at the top. Dirty gas flow normally enters the baghouse and passes through the bag from the inside, and the dust collects on the inside of the bags. Shimi Research Center Private Limited is a leading Pulse Jet Bag Filters manufacturer in India. We supply high quality Pulse Jet Bag Filters in different parts of the world which are manufactured using best quality raw materials. At present we are one of the leading exporters of Pulse Jet Bag Filters to South Africa and Middle East countries such as UAE and Saudi Arabia. The bag filter/ baghouse dust collectors work on the basic principle wherein the dust-laden gases enter the baghouse and pass through fabric bags that act as filters. The bags can be of woven or felted cotton, synthetic, or glass-fiber material in either a tube or envelope shape. Pulse Jet Bag Filters are used for pressure-jet cleaning by a pulse of high pressure compressed air in order to remove dust from the bag. In this type of dust collection, the filter bags are suspended from a tube sheet at the top of the collector and are internally supported by cylindrical wire cages to prevent them from collapsing. The short air burst enters the top of the bag tube, which is about 0.1 second and it takes about 0.5 seconds for the shock wave to travel down the length of the bag. The blast of compressed air must be powerful enough to ensure that the shock wave will travel the entire length of the bag and fracture the dust cake. This will cause a brief controlled inflation of the filter to dislodge the accumulated dust cake into the collection facility. Due to its rapid release, the blast of air does not interfere with contaminated gas flow. Therefore, pulse jet baghouses can operate continuously and are not usually compartmentalized. Cleaning mechanism allows bag filters to be cleaned while the system is online. More complete cleaning than shaker or reverse air baghouses, lengthening bag life. Operates at lower pressure drops and with lower space requirements. Requires the use of dry compressed air. Requires special fabrics for higher temperatures. Cannot tolerate high moisture levels or humidity in exhaust gases.